The famous photographer Yosuf Karsh wisely said that “character, like a photograph, develops in the dark.” We know this, don’t we? That it’s against the dark that we’re able to appreciate the light? Mary Oliver has more to say on this—as she tends to do—and her words are at the end of this post, and worth a read. And I would say “no, pumpkin, no” (in the deadpan British accent of Rupert Everett in My Best Friend’s Wedding). See, biscuits are an entirely different category. They are covered by a separate rule which I like to call the “more is more” rule. 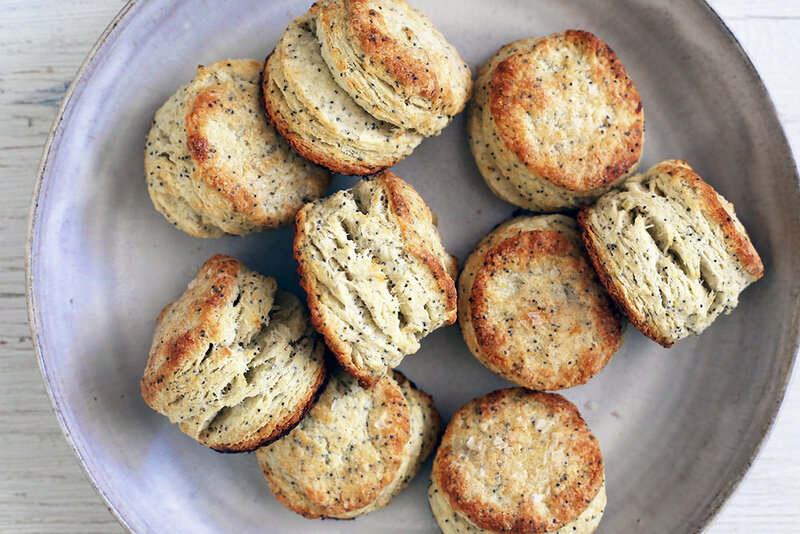 Or—if you need further convincing—consider that practice makes perfect, and your biscuits will be exceptionally flaky and high-rising once you master the gentle folding technique required to get the right height. The trick with biscuits—and how you get such excellent layers—is to not overmix the dough. You want it to look slightly too shaggy and messy. Resist the urge to mix and press it together with your hands more before shaping it. You’ll think it looks too dry in spots and too wet in other spots, but that’s just right. At that point, turn it out onto your work surface and gently fold it over onto itself again and again, pressing lightly each time. The dough will come together enough, and it’s this folding that will create all the layers. 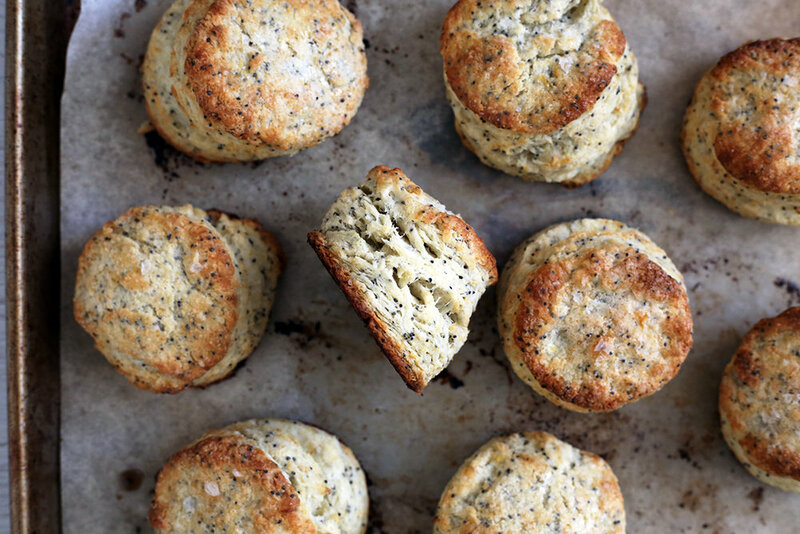 Another reason to bake more biscuits? They’re such a fantastic blank canvas. Typically we see savory biscuits, or plain ones, but there are so many killer sweet combinations to try. Like today, I upped the sugar slightly in my regular recipe, and added lemon zest and poppy seeds. I brushed the tops with melted butter and sprinkled them with sugar and flaky sea salt (a touch of salt to finish is always a good idea with sweet baked goods). In order to really get the lemon flavor to come through, I like to rub some of the lemon zest into the sugar before mixing the sugar into the dough—this releases the oil from the zest, perfuming the dough more uniformly. I also add some zest later on with the poppy seeds (again, note, more is more). In a small bowl, mix together the sugar and the zest of two lemons. Rub the zest into the lemons with your fingers until very fragrant. In a large bowl, whisk together the flour, baking soda, baking powder, salt, and lemon sugar. Cut 10 tablespoons of the butter into the dry ingredients using a fork or pastry cutter until it's in mostly pea-sized chunks -- some chunks can be slightly larger and some smaller, but don't overwork it. Add the remaining lemon zest and poppy seeds and stir to combine. Turn the dough out onto the parchment-lined sheet, and fold it over onto itself until there aren't any dry spots remaining. Don't think of this as kneading: You want to handle it gently and as you fold, the wet/dry areas will disappear. Fold about 10 times, then gently press the dough down to a disk about 2 inches high. Using a round biscuit cutter, cut the dough into 2" circles and separate them slightly on the baking sheet. Melt the remaining 2 tablespoons butter and brush it over the tops of the biscuits. Sprinkle the tops with a bit of sugar and flaky sea salt. Bake for about 12 to 15 minutes, or until golden brown. Let cool slightly, then eat!